Most of the time I at least have a vague idea of the history of the stores I post. This one, I must confess, I know virtually nothing about. It appears to be an A-Frame Acme with a new facade on the front, but I have no evidence that it ever was. I do know more recently, it was a Valley Farm Market which closed in 2015. Superfood, an Elizabeth, NJ-based chain of three stores, bought the store and reopened after some renovations. As far as I know, they've made it more of a standard grocery store. The bakery department was removed, but the store now has produce, deli, meat, seafood, hot food, and salad bar. At 50,000 square feet, this store is much smaller than Valley Farm's other location in Bethlehem, but much larger than Superfood's other locations, in Elizabeth (about 15,000-20,000) and Middlesex, NJ (35,000). It's a very nice, clean store but some customers have been complaining about the high prices. To be fair, I didn't look too extensively at the prices. Being from northern NJ, I'm also used to paying more! Because of the logo they are using, the storefront ends up reading "Superfood Marketplace Marketplace" since there is already a "marketplace" underneath "Superfood". Not as bad as Superfresh Food World, but it would not be my first choice. Let's head inside . . . This is what makes me think it's a former Acme. Even if it's not, it's still a really cool building. It seems a little on the big side for a 1960s A-Frame Acme, but I could be wrong. If this really was an Acme, then probably Valley Farm would have taken out the first maybe three aisles to expand the produce aisle. Based on the lighting, which Valley installed, the produce aisle has been this setup for a while. However, the produce department also goes into an area to the right under a much lower drop ceiling. It's most likely an expansion. If this was an Acme, it could have been a backroom. The entrance is behind me here. Straight ahead there is a small bakery section, although there is no in-store bakery (which Valley had). Unfortunately the flooring seems to be new from Valley's last remodel, at which point the entire store's would have been replaced, so there is really no evidence of expansion or any layout changes. Along the back wall, there is a long counter that has the service deli, meat, and seafood departments. My back is to the grocery aisles here. Once again, the service departments are under a much lower drop ceiling, in what could have been backroom space. In front of the deli counter was a very nice hot food and salad bar, which I unfortunately could not get a picture of. Looking back towards the produce aisle, we see the meat counter to the left here. The seafood and deli counters are past it on the left. In the last aisle, there is what is probably another expansion, with frozen and dairy. This store was pretty impressively well-stocked! As you can see in this picture, there are some White Rose-brand products, but most of the storebrands around the store were Parade, from The Federated Group. In the grocery aisles, all the shelving is new. Superfood added it when they moved in this past summer. I know a lot of people really don't like this style of shelving, but I think it's much better than the regular type. 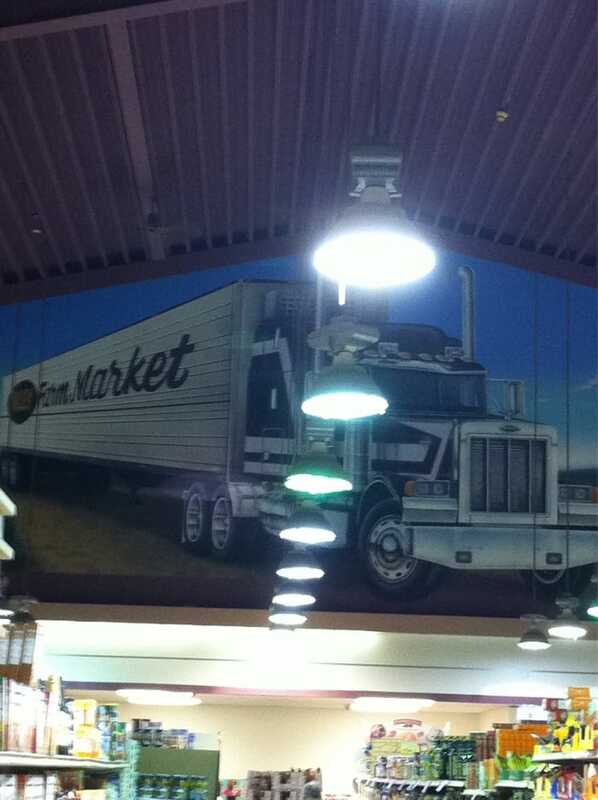 Along the front wall, over the checkouts (which are under a drop ceiling also), there is a huge mural of a tractor-trailer truck that originally said "Valley Farm Market" on the side. When Superfood took over, they clearly did not want to remove the mural but also could not change the name on the side. So "Valley Farm" has been replaced by a cut-out decal of the Superfood logo, so that it reads, unfortunately, "Superfood Marketplace Market". It's pretty haphazard but still a nice touch. This person did not stand with a light fixture directly between them and the logo! There are maybe 5 checkouts, and a customer service counter, along the front end. The registers look to be very old - maybe someone can identify what store they are from! In a nice store like this, why do they ruin the front-end with that awful neon Customer Service sign? It doesn't match anything in the rest of the store (although it may have at one point), and it's just plain old ugly in my opinion. The room with the windows is a manager's office. The exit is behind me to my left. All in all, Superfood is a really nice store. I personally liked it a lot better than the Valley Farm I went to in Bethlehem, but I can understand why some people wouldn't. For one, it's a heavily Latin-influenced supermarket. The owners are Portuguese and Hispanic, as are many people in the area, and the products they sell reflect that. One interesting note - several of the carts they were using were from Twin City Supermarket, a small chain of stores in my area of northern NJ (Elizabeth, Newark, Plainfield; Aquí Market in Jersey City and Bridgewater; and Pueblo in Newark). I wondered why but then I found that the owners of Twin City and Pueblo also co-own this store with Ana Lemes, who owns Superfood in Elizabeth and a few other small stores in the area. So that makes sense! Hopefully someone who knows more about this area can tell us whether this really ever was an Acme, and fill us in on some more historical details! I'm leaning toward not an Acme, but it sure looks like one. And you're right about the logo - or they could have created an alternate version of it. It's not on my list of Acme locations but that's not 100% accurate. The interior ceiling makes for a very convincing case, though. Yes, I've heard from multiple people that it doesn't appear on any lists of Acme locations. Just to clarify (I should have included this in the original post), it's located at 704 W Emmaus Ave in Allentown, PA. This was a private owned store called Traub's Market, named after the owners who's last name was Traub. I don't know when it originally opened, but it was already there when my parents moved to that neighborhood in 1971. It remained Traub's until Valley Farm bought it. I was just there today for the first time since it became Superfood, and was shocked and surprised to see an armed security guard at the front of the store. Does anyone know why there is all of a sudden a need for an armed guard in a grocery store that is located across the street from a middle school in SOUTH Allentown ? Okay, thanks for the confirmation! It was likely never an ACME then, because that would mean ACME lasted only about five years, which is unlikely given the building's significant differences from ACME's 1960s model. Being from northern New Jersey, where EVERY major supermarket - no matter how nice the area is - has at least one armed security guard, I can't say that's surprising. Maybe given Superfood's roots in my area, they figure it's better to be safe than sorry. Do other supermarkets (Weis, Giant, Wegmans) in the Lehigh Valley have security guards? Vintage Photos of NJ Supermarkets!